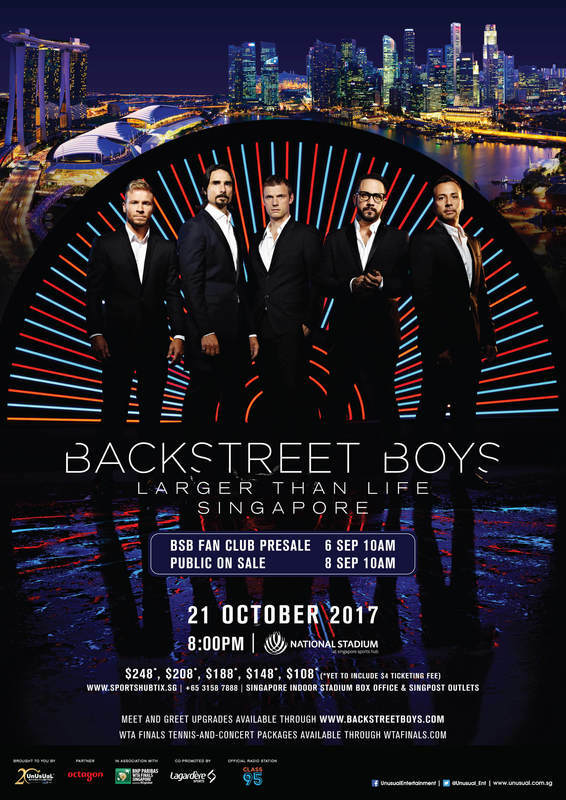 The best-selling boy band of all time, Backstreet Boys, will take over the National Stadium on October 21. The band is specially flying out to Singapore to perform for one-night, in conjunction with the 2017 WTA Finals. This will be their only stop in Asia. Presale tickets will be sold on the venue's ticketing platform via the "tickets" link HERE. Paid and active fan club members will need a password to access this sale. This password can be found in members' dashboards now. *VIP Upgrades will be available to active fan club members for 24 hours. VIP Upgrades will open up to the public at 10am - local market time on Friday, 9/15/17. *Fan club members will not need a password to purchase VIP upgrades. VIP Upgrades will be available below. For the quickest purchasing experience, we recommend you are logged into your account before the presale begins.